Forty-five years after Dr. Martin Luther King Jr. was slain in Memphis, Tenn., we are seeing the resurgence of a movement for economic justice. Dr. King was in Memphis in April 1968 to support of one of the most significant labor and civil rights struggles of the time: Some 1,300 Memphis sanitation workers went on strike, with picket signs that read, “I am a Man.” The whole world was forced to pay attention to a peaceful yet determined demand that being human means being treated equally, regardless of race or ethnicity. The sanitation workers demanded to be able to make a living wage and be treated with respect at work. Sadly, hatred and resistance to change cost Dr. King his life. His leadership and martyrdom inspired and continue to inspire so many to stand up for racial and economic justice. April 4, 2013: In New York City hundreds of workers in fast food restaurants go on strike. Their demand: $15 an hour. Nearly all fast food workers are relegated to grinding poverty at minimum wage–$7.25 an hour in New York–and they picked April 4 to hold their job action, part of a growing movement among our nation’s poorest workers. 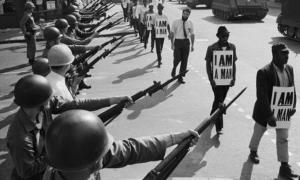 Alvin Turner, now 78, and Baxter Lynch, 73, were on strike when they were sanitation workers in Memphis in 1968. The two social justice veterans were in New York to encourage a new generation of poor workers to stand up and make the struggle just as they did. In 1968, Turner and Baxter made 65 cents an hour. The $7.25 an hour that fast food workers make today places them in the same position of being too poor to survive, just like the Memphis sanitation workers, 45 years ago. 21 percent of the jobs lost in the Great Recession of 2008 were low-wage jobs, but 58 percent of the jobs created during the “recovery” are low-wage jobs. By contrast, 60 percent of the jobs lost during the Great Recession were middle-wage jobs, but, only 22 percent of those created during the recovery were these better paying jobs. Since the end of the Great Recession, 43 percent of all jobs created have been in the low-paying industries of food service, retail and employment agencies. Grotesquely, 31 states have introduced “wage suppression” bills; that is, legislation to repeal core wage standard and minimum wage laws. As we remember the passing of Dr. King, it is encouraging–even uplifting– that a new generation of poor workers has decided to engage in a real struggle. Think of the courage it takes for minimum wage, fast-food workers across New York to walk off their jobs and take a stand. This movement is bound to grow and while many of these workers have a lot to lose, many also recognize that they must risk what little they have if they are to have a chance to stem the tide of raw economic injustice. Forty-five years later we remember Dr. King, we remember Alvin Turner and Baxter Lynch, and in the future we will remember the fast-food workers who took a stand.